In the southwestern most corner of New York State, where NY land meets Pennsylvania, Ohio, the northern reaches of the rugged Appalachian Mountains, and the waters of Lake Erie, there are some special places that trail riders ought to experience. This nexus of land and water is in the diverse Cattaraugus and Chautauqua counties, home to the Ellicottville Rodeo, the internationally known Chautauqua Institution, and the birthplace of legendary comedienne Lucille Ball; it is also substantial horse country with great trail riding opportunities. In addition to horses, this rural landscape is home to significant agricultural production including grapes, timber, maple syrup, orchard fruits, and vegetables. It is also home to an Amish community, started in 1949, which produces world renowned hand-crafted goods. Cattaraugus (or Catt County as it is known locally), the eastern most of the two counties, is on the northern edge of the Appalachian’s Allegheny Mountains, also known as the “enchanted mountains” for its charming effects. Catt County has four trail riding systems totaling more than 95 miles of trail, some interconnecting and all within a 30 minute drive. Like most good things, this trail riding mecca has been nurtured and developed over time by the local horse enthusiasts. The community invests in its equine businesses, recreation and tourism with the support and guidance of the Equine Advisory Committee (EAC) of Cattaraugus County. The EAC’s efforts are enhanced by the work of local people and riding clubs including the Catt/Chau Chapter of the NYS Horse Council, and members of the Little Valley Riders Club. Be sure to recognize the hard work of these generous folks. Additionally, please do your part to help perpetuate a great trail experience and continued access for all horsemen through courtesy, stewardship and awareness of local trail rules. The anchor of the horseback riding trails in Cattaraugus County is in Allegheny State Park (ASP), just south of Salamanca, NY. The Park has over 55 miles of interconnecting loop trails which offer a wide variety of terrain with good footing, and a multitude of beautiful, marked trails, The trails meander through forested lands, including along the ridge tops and down into the valleys and across the streambeds. The Allegheny State Park, a seasonal facility, offers a horse campground in the Red House section, and ASP’s Quaker Area has a few cabins with horse set-ups and day use horse trailer parking near a trailhead in a southwestern part of the Park. North of ASP, the trailhead for the Pat McGee Trail can be found in the northeastern part of the City of Salamanca. The Pat McGee Trail is the backbone through the county and provides a link to a local trail system. This 12.2 mile, multi-use, natural surface trail runs from Salamanca through the town of Little Valley ending at the northern trailhead which lies south of the Village of Cattaraugus. The northern end of the Pat McGee Trail is more wooded with interesting natural features while the southern end traverses more open farm land. Amongst local trail riders, the linear path is a vital part of their trail system for its horse-friendly towns with stores, restaurants and entertainment. The Pat McGee is also viewed as a valuable asset for carriage driving, training new trail horses and acclimating novice trail riders. Furthermore, its well-drained surface makes for sustainable footing in most any weather. The Little Valley Trail (LVT) system in the Elkdale State Forest is known for its breathtaking views, abundant wildlife, and streams. LVT offers some wonderful and amazingly peaceful tall stands of pines and lush ferns up to your horse’s belly. LVT offers one-, two-, and three-hour loops and if you are so inclined, you can traverse the loops in way that you ride all day without repeating. You can find parking for horse trailers and campsites at the Little Valley Horse Park along with access to both the Little Valley Trails and The Pat McGee trailheads. Little Valley Horse Park is owned and cared for by the Little Valley Riders, a family-friendly group started in 1952 that promotes horsemanship and family un. If you do not have a horse, guided trail rides are offered in the Elkdale by The Crosspatch, a local stable which offers a wide variety of equine related activities and services. The folks at The Crosspatch, Dolly and Jim Little proprietors, keep up the trails at Elkdale State Forest and we all benefit from their fine stewardship. The Pine Hill/South Valley Forest is a NYS-DEC property to the northwest of Allegheny State Park with 26 miles of marked trails. The trails are wooded and ranked from easy to more difficult. Many trails are old two-track logging roads and ideal for carriage driving. While many trails are covered with soil and organic matter, there are some areas with exposed rock, therefore horse shoes are recommended. 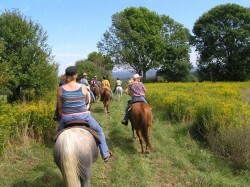 The NYS-DEC Pineapple Junction Horse Camp is available free of charge and on a first come-first served basis. Note that you need to bring your own water for camping. 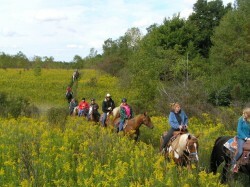 Trail riders interested in travelling to Cattaraugus County and riding all this wonderful country will find well-organized resources including maps, accommodations, equine service providers, and other entertainment through the county tourism office at http://enchantedmountains.com/. As Cattaraugus County horsemen and women continue to build and maintain their horse-based recreation and economy, neighboring Chautauqua County trail riders are working to realize a grand plan that will confirm their region as a trail riding destination. Much of Chautauqua County’s horse trail work has emanated from the Lou Eibl Corral riding and social club and the Catt/Chau Chapter of the NYS Horse Council. Lou Eibl Corral (LEC) has a long history in the area. Launched in 1949 as the Rodeo Riders of America, the organization was originally formed with the purpose of promoting western riding and attire. As the rodeo scene waned, the organization changed its name to LEC and went on to promote a diverse array of horse-related activities while building a strong organization and involving multiple generations of families. Sixty five years later, Lou Eibl Corral is going strong. In its early years, LEC had a piece of property which served as a gathering place and trail head for their riding trails. This worked well for many, many years. Due to changes in ownership of the parcels on which the trails were built, the new land owners, often from away and not familiar with horses and over time, many withdrew permission to ride the trails. In response to the changing circumstances, the Corral purchased a new property for the club in 2005 which was adjacent to NYS Department of Environmental Conservation (NYS-DEC) land on which they could ride. Shortly thereafter, NYS-DEC closed the trails to LEC and all other horseback riders. Some members of LEC had travelled to horseback ride at Big South Fork National Recreation Area on the KY and TN border. After riding the 212+ miles of horse trails in the beautiful forested and mountainous land, and seeing the draw for riders and boon for the local economy, they concluded that Chautauqua County had similar potential. Upon their return home, they developed a general plan for a horse trail system with supporting amenities and services including hitching posts at retail stores and restaurants. They also envisioned the availability of private businesses offering overnight accommodations for people and their horses at bed and barn establishments and at campgrounds designed for people travelling in campers and horse trailers. A general plan was proposed to Chautauqua County leadership including the Industrial Development Agency. Bill Daley, the director instantly understood the regional tourism potential of the plan. Momentum for the project benefitted from existing and compatible trail and greenway planning led by the CC Planning Department. From there, public/private collaborations and partnerships were formed that enabled the development of a formal Equestrian Trail Plan for the Boutwell State Forest/Cherry Creek area of Chautauqua County, funded and administered by the Department of Planning and Economic Development. The plan was prepared by Alta Planning & Design and was unveiled to the public on March 30, 2011. The Boutwell Forest/Cherry Creek Equestrian Trail Plan includes the development of 35 miles of equestrian accessible trails using public and private lands. 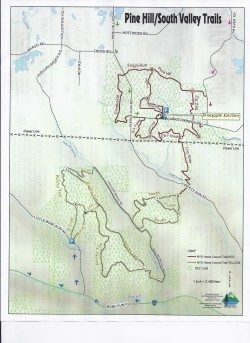 The trail system will connect northern Boutwell State Forest to Cockaigne Ski Area in the south to the Village of Cherry Creek to the northeast and then northwest out of Cherry Creek to northern sections of Boutwell Forest. The trails will run on a combination of public, private, and utility company land and the system eventually will be expanded with additional loops on the Boutwell Forest and connections to trail systems and tourism and entertainment destinations in Cattaraugus and Allegheny counties. Boutwell Forest, owned and managed by NYS DEC, is a beautiful wooded area with stands of pines, trails along streams, and areas with beds of ferns. We have wonderful vistas and rolling hills. The trail sections on two-track dirt roads are wonderful for carriage driving. ies. Soon there will be approximately 135 miles of horseback riding trails, much of it interconnected, all within a 45-mile radius of Little Valley, NY. And, there are plenty of horse and horse enthusiast amenities and services including lodging, food and entertainment in the community with more to come. It sounds increasingly enchanting to me!